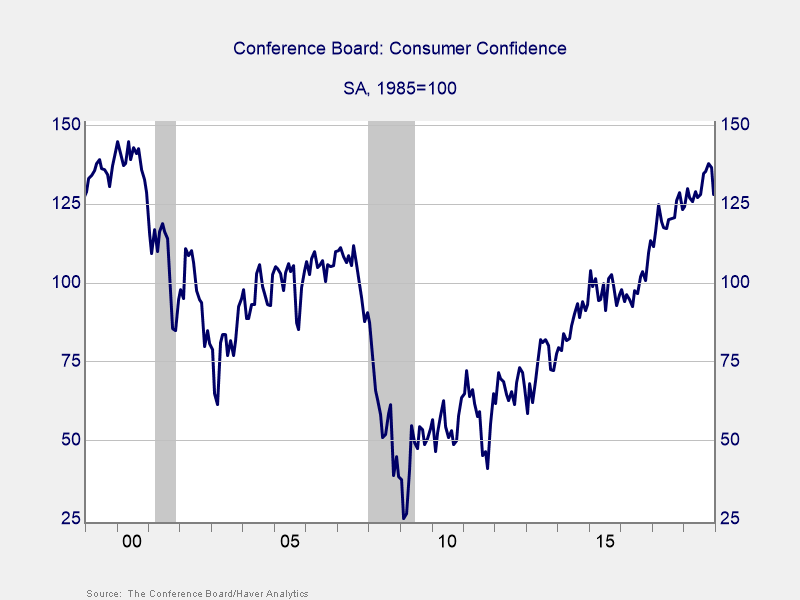 Is Consumer Confidence Signaling Danger Ahead? As I’ve noted before on this blog, in many ways, the current economy is as good as it gets. It is bound to moderate or roll over—only to see things get even better. This scenario has been going on for some time now, to the point where I want to think about what could really signal a downturn. 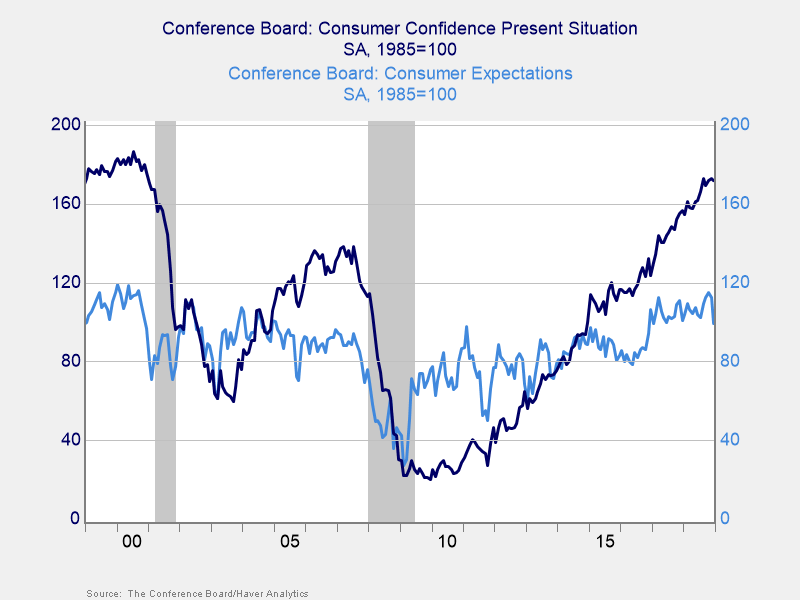 Could consumer confidence be one of those signals? 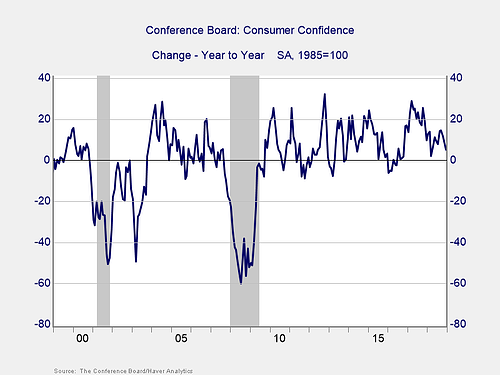 Even when we look at the year-on-year changes, which we do in the Economic Risk Factor Update, we still see that confidence is actually up over the prior year, keeping it well out of the risk zone. Again, if confidence bounces back after the shutdown is resolved, we could see the annual change tick up again, taking it even further from the risk zone. And if things continue to slow? Given the gap between where we are and where risks rise, we likely have quite a bit of time before confidence decays that much. In other words, nothing to worry about for some time to come. This same case remains true when you look at the headline index and, indeed, continues to be the base case for the economy and the markets. The underlying assumption, however, is that any changes from where we are now are likely to be slow and smooth and to take a while to show up in the data. In other words, there is an assumption that the top-line trends are good indicators of what will happen in the short term. When you take a deeper look, though, you can see an increasing disconnect between how people feel about the present and how they feel about the future. Present conditions (dark blue line in the chart below) are indeed very strong. They have consistently climbed at a steady rate since 2010 to well above where they peaked in the 2000s and close to the late 1990s record levels. People feel extremely good about where they are right now, economically. The present-conditions numbers are consistent with the headline numbers and lead to the same conclusions. But expectations about the future (light blue line) are not nearly as positive. They topped in early 2017 and have been stable overall since then. They are not bad—people feel good about the future but not great—and are at the levels of the mid-2000s and somewhat below the late 1990s. More significant, we have not seen the sustained growth that the present-situation index shows. Also worth noting is that the recent decline shows up here and not in the present-situation index, suggesting that the recent turbulence may be damaging confidence in the future and raising the risk that a decline in the present-situation index might be next. One way to quantify that risk is to look at the gap between present conditions and expectations. The larger the gap, the greater the potential downward pressure on the headline index. We can see below that the gap right now is much greater than it was in the mid-2000s and is approaching the level of 2000–2001. 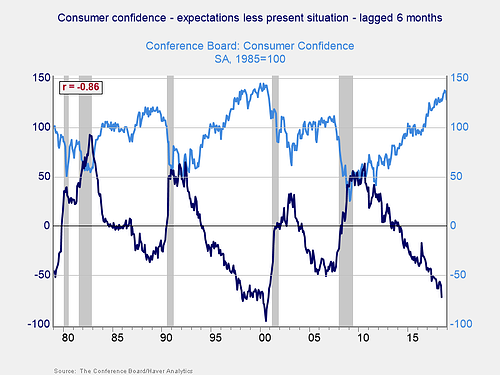 Based on this gap, the potential risk for a fast and material decline in confidence, potentially to a danger zone level, is real and might happen faster than we now expect. In fact, if you look at the past 40 years, that is exactly what has happened. 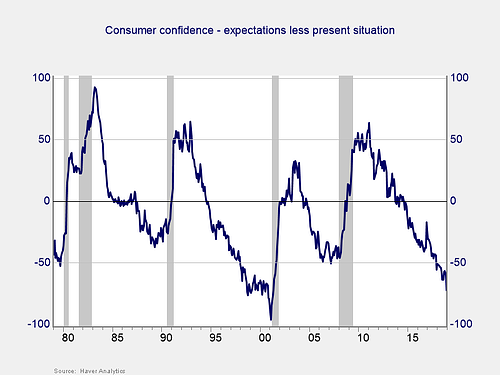 A big gap between expectations and present conditions has usually led to a decline in consumer confidence in the next six months, which is much sooner than the headline indicators would suggest. 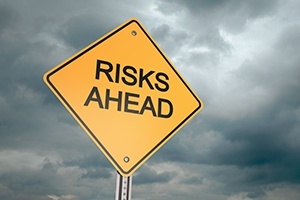 Looking at this data, the risks to confidence are both more significant and potentially much closer than other data would suggest. 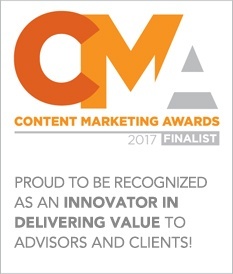 Time to panic? Not at all. As I discussed earlier, there is a real chance we get another bounce up as some of the current concerns resolve. If they don’t, though, we need to be prepared for the data to decay faster than we might have thought. Consumer confidence is a foundation not only of the real economy but also of financial markets. As such, it now needs to be monitored closely. As always, we at Commonwealth will be doing just that.